How can we learn differently in the 21st century? New tools and new ways of knowing create new learning opportunities. We can easily connect to our community and even the globe by taking advantage of the technology we have today. Convenient internet access alters our learning methods and tools for researching, investigating, imagining and communicating. Immediate global connections enhance our awareness, understanding and engagement with other cultures. Internet sources allow simultaneous research from diverse approaches to be considered. New digital imaging programs help us chart, track, test, model and observe ideas over time. New graphic programs allow us to organize our presentations in new and exciting ways. There is no end to the new ways that we can learn about ourselves, others and the world around us. 21st century learning asks us to create new learning experiences and new learning spaces. Go to the ArcGIS Onlinewebsite, and find out how they map the world differently. Then think about how you can map the route from home to school / work using sensory experiences, such as temperature, emotions, sounds or visions. 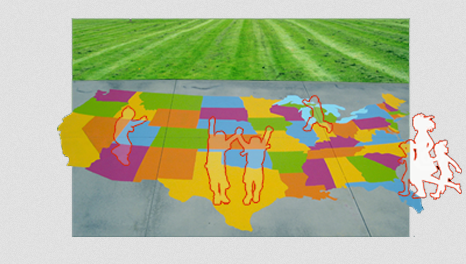 Using this new mapping technology, try mapping activities in a current K-12 classroom. Map what happens on the floor, on the walls and on the ceiling. How can we use these surfaces more creatively? Where do we need to write, draw, project and pin up work? Next, look at what activities occur in the classroom. Make a list of everything that happens during the day. Include the teacher as well as the students and guests. Think about the experience of each of these different ‘user types’. What is their path or flow? What do they first see when they enter the classroom? How do they navigate the space? Where do they go and what do they do? Next look at which activities are done individually. Which spaces are for working collaboratively? Which activities need more space? Which activities need more flexibility? Make a list of all of the existing equipment in the classroom. Note the desks, the chairs, the blackboards, couch, shelves, etc. Now the fun begins! How will you redesign learning? How will you create a new way of being in school? Make a conceptual model that introduces new surfaces, new seating, and new technology to a classroom. Activity 2 – Imagine new ways of learning! Play a game from the PBS Kids website, and think about the learning experience. What are the differences between your perception of the title of the game and the content of the game? How might a 21st century learning environment blur the boundaries between exploration, play, fun and learning? What kind of spaces will you need to open up opportunities for new learning and making activities? Take a look at Settings for Learning New Approaches and explore different types of spaces for learning in new ways. What kind of new technologies would you like to see integrated in your school? Think about design thinking, research and making. Watch Creative Places +Spaces. 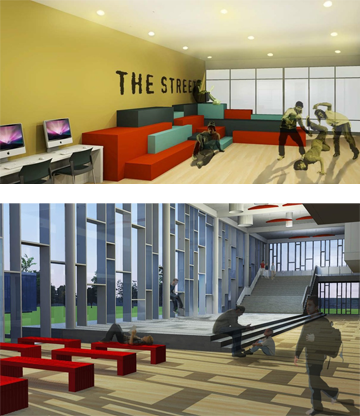 Consider creating a series of new learning spaces with new opportunities for working and creating. An idea space is a space where ideas are explored. What will you need in an idea space? 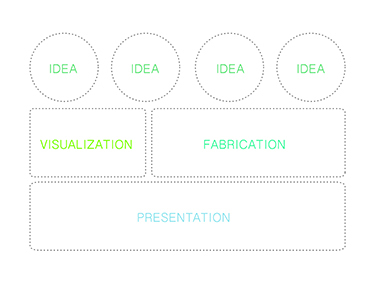 A visualization space is where ideas can be diagrammed, imaged and graphically laid out. What will you need in a visualization space? A fabrication space is a space where ideas can be constructed and tested. What will you need in a fabrication space? 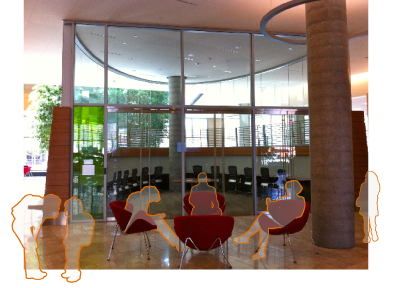 A presentation space is a space where ideas are shared throughout the process and at the completion of the process. What will you need in a presentation space? For each new space, come up with the number of people who will use the space; what furnishings you will need, what digital technologies you will use and what connection to the out of doors or other areas you might need. Create one space with these four areas or create different rooms that are connected. This activity can be done on your own, but it would be much better if you ask your friends to help! Visit an elementary school classroom, take a look around and make notes of what you see. Next, take a picture of the overall classroom. Label all of the zones, areas, objects, and equipment. Take individual pictures of activity areas, key furniture and equipment. Draw an existing elementary classroom floor plan and perspective. (See the perspective and drawing types journeys for assistance). Now use your imagination! What would you like your classroom to look like? What different areas do you envision? Does your classroom have a door or a glass wall that closes? Does your classroom have a projection screen or a projection wall? Can you replace the blackboard with a smart board? How can you use the ceiling, walls and floors in a more creative way? Is there anything living in your classroom? Does your classroom have desks or tables for students? What kind of seating would you like in your classroom that is not there now? How can learning be an event? How can learning engage your imagination? Draw a classroom of the future with all the equipment in your elementary school classroom, but this time turn all that equipment into 21st Century innovations. Anything crazy or imaginary is encouraged! What does a learning space in public look like? Make a list of local educational institutions. Think about local museums, libraries and environmental education centers. How are they alike? How are they different? What kinds of learning experiences occur at each of these different educational settings? Do you learn from performances and lectures? Can you wander in and explore by yourself? For each institution, list what you go there to learn. List the spaces that you learn sitting down listening, interacting, and moving through experiencing spaces. Imagine bringing these learning experiences outside of the buildings onto the street or into the park. What kind of things can be learned in a public (or street front) setting? 21st century learning involves embedding information in the public realm. Can you site some examples? Some cities have clocks that tell the time. Some bus stops tell when the next bus will come and what route it will take. Some taxis tell the news and the weather. What would you like to tell(teach) and where would you like to put it in the public classroom? What can a 21st Century Classroom offer? Which of the following is not found in a 21st Century Classroom? A 21st Century Classroom offers different learning experiences. Playing online interactive games makes learning fun! What is the advantage of connecting globally in a classroom?